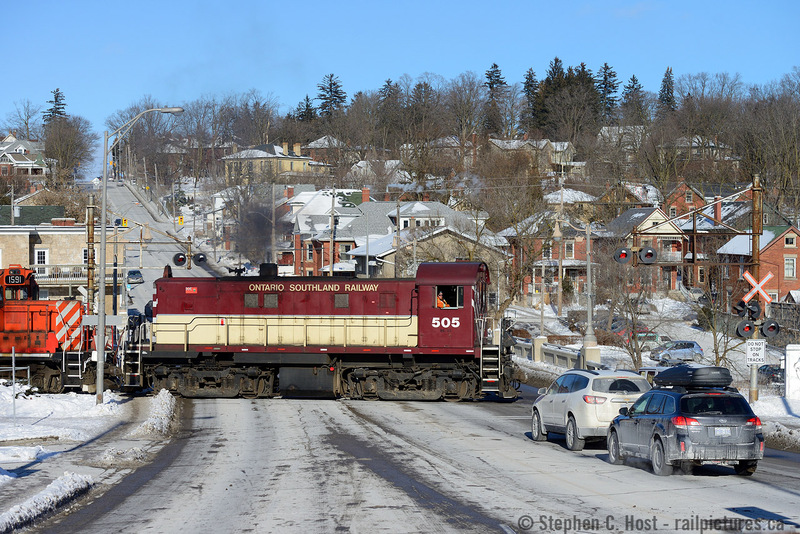 Railpictures.ca - Stephen C. Host Photo: Ahh… I long for those cold, crisp, but ‘kodachrome sky’ days in winter where the sun’s out and you get much more sun than you do in November. This is where the station was once located, just to the left, and Guelph’s ‘east of downtown’ hood is in the background. OSR 505 is giving a little puff of smoke, traffic sufficiently stopped the crew is getting back up to speed. I thoroughly enjoy these little guys, who make frequent apperances in Guelph, sometimes in pairs or trios if you are lucky. | Railpictures.ca – Canadian Railway Photography – photographie ferroviaire Canadienne. Caption: Ahh... I long for those cold, crisp, but 'kodachrome sky' days in winter where the sun's out and you get much more sun than you do in November. This is where the station was once located, just to the left, and Guelph's 'east of downtown' hood is in the background. OSR 505 is giving a little puff of smoke, traffic sufficiently stopped the crew is getting back up to speed. I thoroughly enjoy these little guys, who make frequent apperances in Guelph, sometimes in pairs or trios if you are lucky. And this date is correct, I believe it was Jacob that alerted me to OSR being out and about. Have 5 keepers from this day and all are 1/6/2018. Rare weekend operations on the GJRY. It’s always time for breakfast Snake. This is a Saturday. Must have been your Breakfast run.